Chelsea’s new manager Maurizio Sarri is not messing about, sending a strong signal by dropping midfielder Danny Drinkwater for his Europa League squad this season. The England international has had a disappointing time at Stamford Bridge since his surprise move from Leicester City last summer, and has not been a regular for the Blues. It now seems Drinkwater’s future at the club looks in real doubt as new manager Sarri won’t even give him a look-in in the Europa League this season – a competition where many top sides give chances to fringe players or youngsters, keen to capitalise on an opportunity to rotate and rest bigger players for more important games. 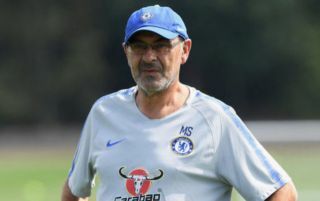 However, the Metro report that Drinkwater has failed to make it in for CFC, suggesting that Sarri really doesn’t value him even as a squad player, and that the ruthless Italian is also taking the competition seriously. Chelsea won the trophy back in the 2012/13 season under Rafael Benitez, while Manchester United are also recent winners, and Liverpool recent finalists. The prospect of winning it and earning qualification for the Champions League might be a tempting one for some, though Chelsea also surely look good enough to do that via a top four finish this season anyway. The Metro note that Chelsea paid £35million for Drinkwater just a year ago, so it really is a fall from grace for a player who shone at his old club Leicester, playing a key part in their shock 2015/16 title win. Still, he hasn’t looked worth the investment for Chelsea after failing to make the step up to a truly big club.